Oh My!! Exactly what I was searching for!! Love this rug ..Colors are distinct and the thickness of rug is just right!! Looks Great in my Bedroom!! 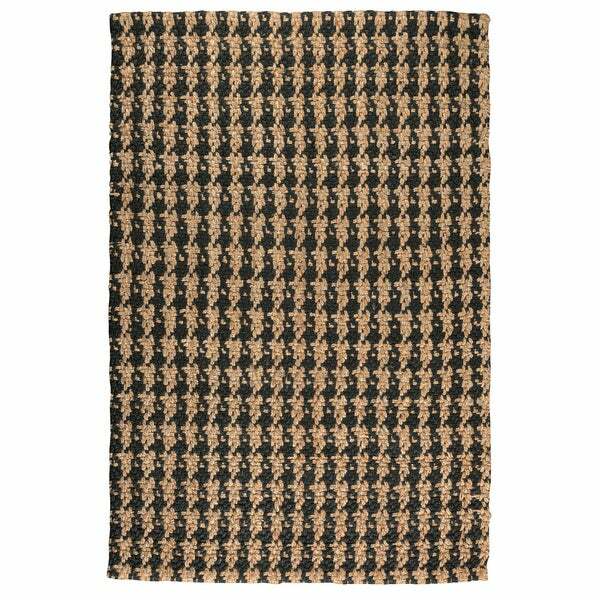 Skilled craftsman weave the sustainably sourced jute fiber to ensure the Kosas Home Handwoven Lad Houndstooth Black Jute Rug has enduring quality and classic style. Best suited for spaced with medium foot traffic, jute is highly durable and ant-static. The neutral colors of this rug lend themselves to any decor scheme and help make it a versatile accent piece for any space. Each Kosas Home rug is hand-woven and unique, with a slightly different color and pattern. This is natural due to variations that occur in wool and other fibers, and the handcrafted nature of our products. Brush dirt and debris away with a brush. Shake off any excess dirt. Vacuum regularly to prevent dust and crumbs from settling into roots of the fibers. Avoid using vacuum cleaner with beater bar attachment. Professional rug cleaning is recommended. Do not dry clean. Do not machine-wash. Avoid direct and continuous exposure to sunlight. Colors may fade over time in sunlight. Remove spills immediately; if liquid, blot with clean, un-dyed cloth by pressing firmly around the spill to absorb as much stain as possible. Rug pad is recommended. Dimensions 96.0 In. X 60.0 In. X 6.0 In. Greyson Living Vera Charcoal/Grey/Ivory Area Rug - 7'9" x 10'6"